Located at the intersection of important colonial ways, Irkutsk became the largest trade and products-distribution center of Siberia in the XVIII century. 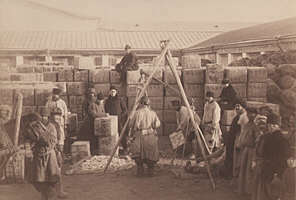 In summer and winter "both by water, and dry ways" the various goods were delivered to Irkutsk. 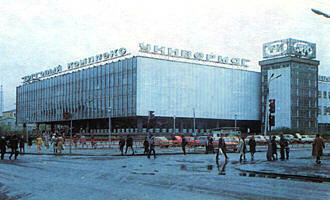 Irkutsk, as the shopping center had four departures. Moscow one went through taiga and rivers, through the Stone belt to Europe; Zamorskii- to Transbaikalian steppes (prairies); Krugomorskoi - to the Southern Pribaikalie, to a famous Chinese public sale, to Mongolia and China; Yakut departure– to the north - to Russian America, to the Lena and Amur rivers, to the cold seas and the Eastern ocean. From European Russia and different places of Siberia the products of textile manufacture, fur coat, iron, copper, honey, sugar, paper were received. The especially valuable popular goods were different kinds of pelt: Kamchatka beaver, sable, fox, fur seals, walrus, ermine, Arctic foxes, otters. Through European Russia the goods from Western Europe - German, Dutch and Spanish silk and linen products were delivered as well. The Chinese goods - textile products, tea, Chinese ink – were taken to Irkutsk from the Chinese border through Kayhtinskii border post. Among subjects of local manufacture the following ones prevailed: flour, cereals, nuts, meat, bacon, leather, wool. Fish, especially omul was a popular commodity. Among minerals mica, iron, lead, silver were on sale. 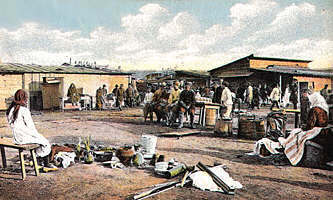 A core of trade life of Irkutsk was guests court yard, besides it goods were on sale in trade lines and separate shops. The class of the enterprising commercial and industrial people engendered in Irkutsk, in the first decade of the XVIII century. Merchants was the most numerous group of the city dwellers. The merchants sold their goods to the local population for expensive prices and cheaply bought up production, made by them, that enriched merchants and caused their prevailing position. In the second half of the XVIII century the Russian-Chinese trade considerably developed. By the edict of June 31, 1762 the government destroyed state monopoly in the Kyakhtinskaya trade and permitted merchants to trade freely with the Chinese in all kinds of soft stuff. For Irkutsk merchants a "golden age" began. They went to the nearby villages and nomadic tribes property, remote northern regions, buying up pelt and “merlushka”, marketing the industrial goods brought from European Russia and China. In the 1760s foreign and domestic trade became a monopoly of large merchants. In 1768 in Irkutsk a trade fair was founded, since 1775 it began to be carried out annually in autumn and spring time: from November 15 till January 1 and from March 15 till May 1. A profit of soft stuff trade induced Irkutsk merchants to search for new fur areas, with this purpose they entered Kamchatka and Aleutian islands. Irkutsk merchants played an outstanding role in development of trade and crafts on the coast and islands of northeast part of the Pacific ocean and Alaska. In 1799 the Russian-American company for fur and hunter craft was founded on the northern islands of the Pacific ocean and Alaska. By the end of the XVIII century the city had two guests court yards: the stone and wooden, grain market, meat lines and six state shops: food, salt, wine, and a shop of the supplies for the Nerchinsk factories. 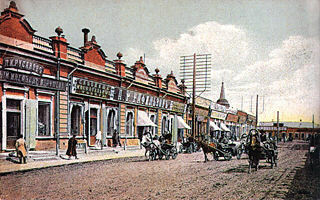 The main branch of economic life of Irkutsk in the first half of the XIX century still was trade. According to the figurative statement of writer M.Alexandrov "trade and profit were shining on the Irkutsk horizon, and in them, as in a focus of incendiary glass, all life and vital activity concentrated". In Irkutsk large merchants – monopolists the Sibiryakovs, the Mylnikovs, the Basnin worked. The exclusive kind of trade in European Russian goods, Kyakhtinskii public sale with China, buying up furs for cheap prices, since the 1830-40s - the goldmanufacture as well - all that enriched Irkutsk merchants, who considered trade to be more profitable than a foundation of industry. On the Irkutsk market besides Irkutsk merchants visitors also traded: from Moscow, Tula, Vologda, Suzdal, Tobolsk, Tomsk, Krasnoyarsk, Yenisei. In 1857 the commodity stock exchange was founded, the main subjects of tender were agricultural products, timber products, stone coal, leather goods, industrial goods. Almost all goods intended for East Siberia passed through Irkutsk. The delivery of goods was made with coaches and partly water transport. A known ethnographer P.Ravinskii wrote in the 1870s : "Irkutsk is a goldfinch: There is not any other Siberian city where you would find such shops with subjects of luxury and graceful taste …". 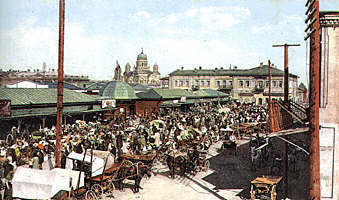 In the development of Irkutsk trade a recession was observed in the second half of the XIX century. In the late 1880s the reduction of trade transactions became appreciable, which was connected with a reduction of gold production on the Lena river and in Zabaikalisk, and an increase of goods import in Priamurskii region and Transbaikalian area by sea, and then on the Amur, instead of Irkutsk. Trade transactions changes with China through the Kaykhta were reflected as well. The opening of the Suez canal facilitated and sped up trade relations of the European countries with China by sea. England, the United states of America and other countries increased import and export of the goods through the Chinese ports Kanton, Amoi, Shanghai, opened for a free trade, that undermined the Kayhtinskay trade. The realization of the Siberian railway and transportation of the goods in and from China completely undermined it and at the same time strengthened economic connection of Siberia with European Russia, that contributed to acceleration and growth of trade transactions. By the beginning of the ХХ century Irkutsk had remained the center of trade and management of Eastern Siberia with a poorly developed industry. "The Siberian commercial and industrial year-book" of 1913 informed, that in Irkutsk there was a significant amount of trade enterprises and government agencies, several banks. In the 1920s in the conditions of a fierce class struggle alongside with the nationalization of the industry, the nationalization of trade enterprises was made. The period of the socialist industrialization, development of national economy within first fire-year period promoted to expansion of trade and increase of trade transactions, where the leading role belonged to the state and cooperative trade, including a significant development of collective-farm market trade. In the postwar years in connection with the development of Irkutsk, creation of industrial view of the city, with intensive building new micro-districts in the city the trade extended and the network of the trade enterprises increased. Today Irkutsk is a modern shopping center of Eastern Siberia. In the city the network of municipal, private and firm shops is developed. Since the 1990s the Irkutsk fair has been revived, which has been opening a road to Russia’s entrance into the business world, near and distant foreign countries and Kyakhta, Bratsk, Krasnoyarsk and other Siberian fairs. The development of show-exhibition activity in Eastern Siberia Irkutsk International ExpoCentre "SibExpoCenter” professionally continues today, entered in operation in September, 1996 by the day of the opening of the largest in East Siberia traditional International Irkutsk fair. In the complex more than 30 universal and specialized exhibitions -, lots of cultural and political fairs are organized annually. The autumn traditional International Irkutsk fair continues to remain the fair of the year. Year by year "SibExpoCenter" get more and more popularity and authority, in 1997 the expocentre became the owner of the International gold prize of quality GQM. In the last years the shopping centers began to appear in the city. Many Irkutsk dwellers and visitors of the city like to visit "Passage", organized in "SibExpoCenter”, the shopping center "Irkutsk", where there are a big choice of the goods, s presence of high-quality production and fashionable goods, abundance of the information about them; the snackbars, mini-cafe, computer games work for rest and entertainment. The main trade enterprises of food products are - municipal Central market which opened its doors of a well-furnished main building in October, 1998, and "New market", opened the same year. The central market is a pride of Irkutsk dwellers, it impresses with volumes and arrangement. Here there are trade lines, and mini shops, elite boutiques with the industrial goods; to the services of the sellers and buyers - bistro, cafe, load speaker communication. Irkutsk dwellers behave here, like in a temple. The outside arrangement are-perfect flower beds, parking place, lace-designed fences of the sitting places, fountain. "A Magnificent structure, which our children and grandsons would be proud of", - so the chairman of the state commission told. admitted only with concent of Scientific Library of Irkutsk State University.